The Bay of Quinte is a long, narrow bay shaped like the letter "Z" on the northern shore of Lake Ontario in the province of Ontario, Canada. It is just west of the head of the Saint Lawrence River that drains the Great Lakes. It is located about 200 kilometres (120 mi) east of Toronto and 400 kilometres (250 mi) west of Montreal. The Bay, as it is known locally, provides some of the best trophy Walleye angling in North America and anglers from all over Canada and the USA visit the area annually. The Bay of Quinte is mainly feed by the Trent River system which is known to have a very prolifc fishing. A variety of sport fish inhabit the area including, walleye, perch, large and smallmouth bass, pike, muskie, white bass, crappie, freshwater drum, carp and catfish. In spring, walleye fishing in the Bay of Quinte is very popular. This area referred to as "Ministry of Natural Resources Zone 20", is the first area in Ontario to open for spring fishing for walleye and pike. Fishermen are anxious to get started after a long winter and this is one of the best places in the world to catch these species. 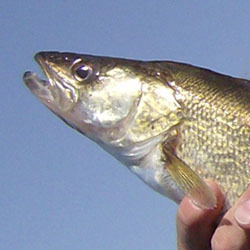 The average Bay of Quinte walleye is 2-3 lbs, although lunker walleye in the 13lb range are not uncommon, making the Bay of Quinte a world class walleye fishery. 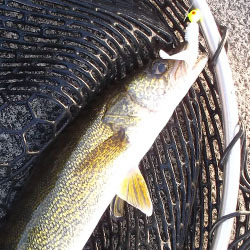 Some of the more productive areas for walleye fishing include include Brighton Bay, the Trent and Napanee Rivers, The Bay of Quinte bordering Trenton, Belleville, east to Napanee, Big Bay, Telegraph narrows, East and West lake, Lake Consecon and all the waters near Picton. The bay is subject to algae blooms in late summer which are a naturally occurring phenomenon and do not indicate pollution other than from agricultural runoff. Zebra mussels as well as the other invasive species found in the great lakes are also present. The most popular event held annually in the Bay of Quinte is the Kiwanis Walleye World tournament. Each year anglers from all over Canada and the USA compete in this premier event. The Trenton Kiwanis Club started this Fishing Weekend over 30 years ago as a new idea for a Fund Raiser. With the assistance of our many sponsors and volunteers over the years, the Fishing Weekend has grown, not only as Trenton Kiwanis Club's biggest fundraisers helping to raise over $800,000 for the community, but as well, the single largest yearly event held in the Quinte area. This Fishing Weekend in the City of Quinte West is one of the largest fresh water sports fishing weekends in North America, attracting over 5,000 entrants each year. This year come and see the 50ft fish tank and listen to many pro anglers as they give you tips on how to catch that prize fish. Each detailed map provides depth, contours, structure, boat ramps, and updated fishing information. 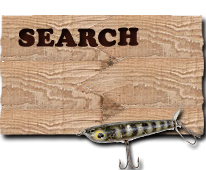 Bay of Quinte fishing maps also include lake info such as gamefish abundance, forage base, water clarity, weedline depth, bottom composition, complete latitude/longitude grid lines and dozens of GPS waypoints & coordinates.